Blocks is a unique, experimental one page vertically and horizontally scaling layout. It's something that little bit different to stand out from the norm. It works across most major web browsers / devices. Comes complete with great, developer friendly code and documentation, for the scaling, height settings and LESS setup and is therefore quickly and easily extendable in terms of general colouring and styles. The main colours are controlled via the @brand-primary variable and accent colours within the css - settings folder - variables.less. Just changing the @brand-primary and compiling your LESS files can have a simple yet noticeable effect! Including an easy to work with structure for the LESS and css files (keeping the core bootstrap LESS files separate) it could also be extended to work with your own themes! Enjoy experimenting further with the layout yourselves! PLEASE NOTE: If you are not familiar with LESS you can just edit the styles.css file as necessary. 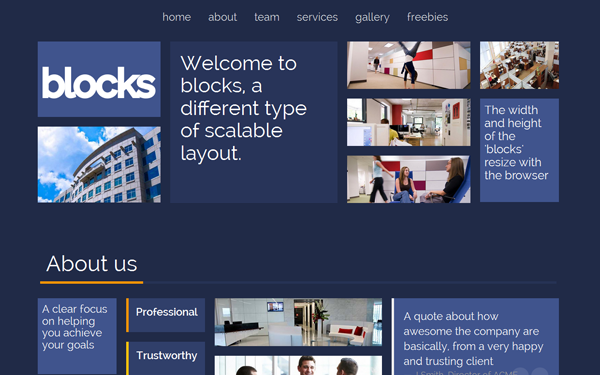 Item Reviewed: Blocks One Page Scalable Bootstrap Theme 9 out of 10 based on 10 ratings. 9 user reviews.